The term “flesh” generally refers to an unbalanced fixation on body sensations or behavior. The focus is external. Paul observed that the mind set on the flesh is death, while the mind set on the Spirit is life and peace. The mind-set of the flesh is hostile toward God and simply can’t submit to His Law of love (Rom. 8:5-7). Scripture speaks often of eyes, ears, hands, tongue, bones, and sinew. An unregenerate soul is as dysfunctional as a body without any sinew holding it together. The mind is in one place, the heart is in another, and the body seems to have a life of its own. That’s because God designed human bodies to respond automatically to many things without having to think about it. The body responds spontaneously to joy with laughter; to grief with tears; to fear with trembling. Sweat glands react to temperature. Pupils dilate or constrict in response to light levels. These are biological reflexes beyond conscious control, but the body can also be trained to react spontaneously—for good or evil. Born in a world inclined away from God, our bodies are prepared to act contrary to Christ because we’re trained contrary to Christ. We kick and hit without thinking when we’re angry. We spew mean-spirited insults and gestures when offended. We strut and brag when we’re cocky. Socially, these actions have become reflexive; it’s considered abnormal if you don’t behave this way—not just today, but also in Jesus’ day. Biblically, it’s called sin that “dwells” in your members, i.e., body parts. They automatically react to sin that lurks in the mind and heart, most of which is learned and reinforced by cultural norms. Unlearning it all is what “death to self” is. It means dying to death and ruin, not to value and life. Self-denial means denying control to sinful habits of mind, will, and body. But again, this is commonly confused with self-rejection, creating a false conflict between denying oneself and loving oneself. How can I love myself if I’m supposed to deny and reject my humanness as worthless? The point is that you can’t avoid sin just by trying to avoid sin any more than you can stop smiling by trying to stop smiling. The inverse is that you can’t become Christ-like just by trying to be Christ-like any more than you can become fearful just by trembling. We need to retrain our bodies with the mind, and reinforce our minds with the body. This is what Christian practice does. Christ first enters through the mind. Faith then forms and settles in the heart, then manifests in the body and behavior. The mind’s eye is the door to the heart because when you “see,” you understand; and understanding becomes belief, which becomes the will—a choice for or against something. The will governs the body because we act from what we believe (or don’t believe). Yet the body also shapes the will. By God’s design, they go together. According to Jesus, the spirit is willing but the body is weak (Mat. 26:41). I wish I had known long ago that failure to consider the body as an element of the soul always leaves us jumbled with little self-control. First, observe the habits that dwell in your body—not to beat yourself up, but to learn the unknown reasons you do what you do even when you don’t want to do them. Rolling your eyes, for example. Slamming doors when you’re irritated. Interrupting when others speak. Constantly complaining about your job, your neighbor, the government. Insisting on having the last word. When these bad manners, to use the old fashioned term, reside in your body, you’re automatically trained to not turn the other cheek or go the extra mile or bless those who curse you. You’re not prepared to do these kinds of Christ-like things easily and consistently. You’re set up to do evil at the slightest provocation. Lost. Ruined. Then speak to God about transformation. His grace makes it possible to retrain your mind, spirit, and body. The Israelites passed from death to new life by grace—by conquering the Promised Land in partnership with God. Likewise, for you and me, the land of milk and honey is on the other side of cultural, “worldly” training that separates us from God. Grace means we can conquer it all and that God will enable us to do so. You can be kind to enemies without gritting your teeth. You can love yourself and neighbors. You don’t have to win every argument. You can learn to react intelligently and lovingly, as Christ did, in all sorts of situations. If you have honest trouble believing it, ask God to help you see the possibility, the vision of transformation (actually, re-formation). Ponder which of Jesus’ qualities you admire most and would like to pursue for yourself with all your heart, mind, strength, and soul. For me, it was his ability to smile—genuinely smile—in the face of offense and idiocy. He’s untouchable in that sense. Once I discovered that I didn’t have to let others control me, kill my mood, flatten my spirit, or ruin my day, I gained a tremendous sense of power. I could laugh in the face of this kind of death. When I realized that I could simply “leave” the slavery, I began to practice tiny little kindnesses on people who were rude or demanding. Instead of giving them the usual piece of my mind, I smiled to myself and winked at God. 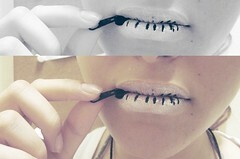 This is one application of the Christian discipline of silence, which helps retrain the tongue and quiet the spirit. It was nothing dreadful or overwhelming. The more little graces I practiced here and there, the easier it came for bigger challenges. Don’t get me wrong, I’m not 100% Christ-like; I still get snippy, worried, and have bad days. But I’m freer today than I was five years ago. It’s a new life-style.